World War Two set off a ripple effect that touched nearly every facet of American life, including that highest of cultural traditions: the Hollywood musical. Musicals had developed at an astounding rate throughout the 1930s, with the advent of Fred and Ginger partnership, and series like Gold Diggers and Broadway Melody. But with newfound limitations on both budget and access, and a shift in audience viewing desires, studios during the war had to reassess their musical output. First off, plenty of excellent dramas and action films could cover the realities and traumas of the war: Mrs. Miniver, Casablanca, Five Graves to Cairo. Musical comedies, as they had almost always been, were the near exclusive domain of escapism. If you saw a movie title with “Sailor” or “Girls” or “Broadway” on the marquee, you could walk into the movie theater with relative certainty that you weren’t going to have your anxieties and worries projected back at you. Sailors’ biggest concerns tended to be getting back to the ship before their leave ended, single gals just had to find a date for the evening, Broadway babies had to put on a show, and foreign nationals smiled big and cracked jokes. A lot of tropes repeated during wartime musicals, perhaps a kind of cinematic response to the austerity encouraged elsewhere in American life. Think of how many wartime musicals feature sailors on leave, or an ensemble of entertainers arranged under the guise of a USO tour, or girls working at a canteen or as military secretaries. The world needed entertainment, and it needed it fast, and using shortcuts like these repeated plot motifs made it easy to accomplish. “Sailors on leave” is probably my favorite subgenre of musicals, and, though the genre continued well into the 1950s, the movies actually produced during the war have a special weight to them. Anchors Aweigh, The Fleet’s In, Here Come the Waves, and Two Girls and a Sailor (among many others) all prominently feature sailor leads, the girls who love them, and their ensuing misadventures. For families at home, these movies gave them something light and positive to imagine when thinking of their boys away at sea. For the sailors themselves, they offered a humorous look at the everyday slog of swabbing the deck, and a vicarious escape to the pleasures that awaited them after completing their service. 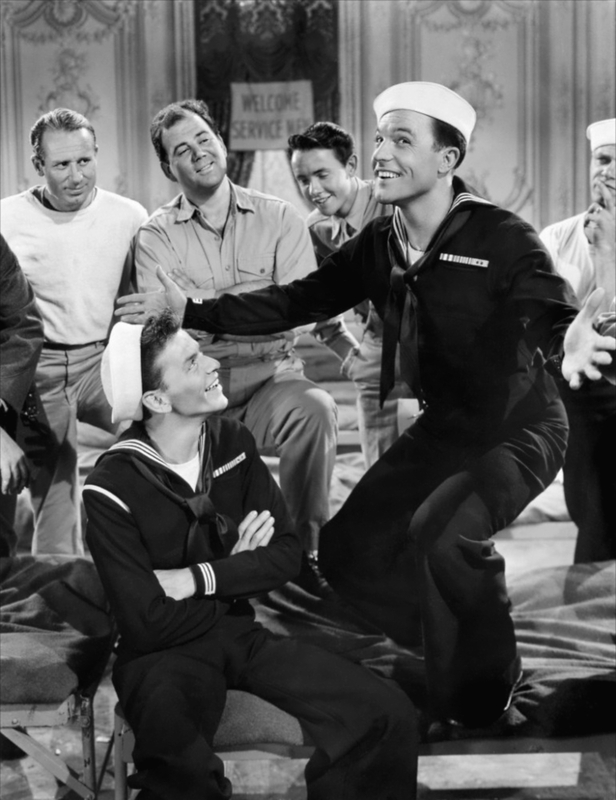 In Anchors Aweigh, sailors Gene and Frank get to go on their adventure, while the boys left on the ship will only get to hear the tales, a fact which they ungraciously expound upon in the opening number. This scenario also mirrors the situation of sailors still at war who would’ve been watching these films—so all the more reason to make it a good story! Off-screen, the ubiquity of pin-up photos boosted the name recognition and, in some cases, careers of many Hollywood actresses, such as Rita Hayworth, Dorothy Lamour, and Betty Grable. Grable in particular became forever associated with her pin-up identity, even starring in a wartime musical logically titled Pin Up Girl. Pin Up Girl features a lot of common features for the era: Grable plays a hostess at a USO canteen who gets a job as a government stenographer, all while wooing a Navy war hero (on leave, of course). Pin Up Girl‘s big finale is a fabulously unique tribute to the time—instead of a sparkly musical number, Grable instead conducts a real-life Women’s Army Corps rifle drill team in a series of intricate maneuvers. It’s fantastic and there are not nearly enough pictures of it online, but I encourage you to seek it out. Pin Up Girl utilizes a common theme of “pretty women in non-regulation military garb,” which we saw a lot during this time as well. Another common solution in wartime musicals was for studios to just throw all their stars into the movie—even if they only appear for a few moments, they could still put them on the poster at least. This had the added advantage of allowing for a lot of different types of entertainment styles, and many recognizable entertainers, for people who might not have the leisure time to be getting out to the theater every week anymore. Canteen musicals, like Stage Door Canteen and Hollywood Canteen, were an easy and period-accurate way to get a lot of performers in a single picture. Many films set during the war but outside the canteen, like Thousands Cheer, included extended performance sequences, often under the guise of having the actual characters in the movie also watching, performing, or organizing them. Modern viewers can find these a bit straining sometimes, as the interludes often last upwards of 20 or 30 minutes, and often involve some specific jokes and humor of the period. At the same time, they also often include performances from huge stars in a more natural state than they might have appeared were they the lead actor or actress. Overall, like many films from the era, lots of of these musicals proclaim strong patriotic sentiments—even beyond the advertisements for war bonds on their title cards. Films with explicitly American themes started gaining in numbers, including the famous Yankee Doodle Dandy. Just looking at the promotional materials for that film, you might not realize that it’s about Irish-American Broadway producer, but perhaps a modern, gender-swapped retelling of the story of Betsy Ross. The film also utilizes a wrap-around structure that involves Cohan telling his story to (who else) Franklin D. Roosevelt. Made in any other time period, Dandy might not have been dripping with quite so many stars and stripes. Of course, many other musicals made during this time didn’t deal with explicit war themes or references. The world gained musicals like Holiday Inn, Meet Me in St. Louis, and the Road(s) to Singapore, Zanzibar, and Morocco in this time too. So, while knowing the context and motifs of the wartime musical may help to understand the films, luckily, it’s certainly not a requirement of enjoying them. This post is part of Classic Movie History Project Blogathon, hosted by Movies Silently, Aurora’s Gin Joint, and Silver Screenings. Check the announcement post here for more information, and make sure to visit their blogs for all the great entries! I just watched Ship Ahoy the other day… A spy pic where the Axis agents are using a plot from a dime novel to get their hands on a magnetic mine, only to run afoul of the writer of the dime novel. It’s got comedy by Red Skelton and Bert Lahr, Virginia O’Brien doing her deadpan routine, Eleanor Powell dancing, and the Tommy Dorsey band playing. It’s not a full-on Broadway-style musical, but it begins with the hottest rendition of Hawaiian War Chant I’ve ever heard! Anyways, just wanted to add that to the review :) Thanks for the post! Great look at the type of film that typifies the studios product. I love the music of that period and find the presentation in film musicals to be magical. I have to say I am a SUCKER for wartime musicals, and I especially love it when studios include lots of cameos. If I were a movie-goer during WWII, I would probably see each one multiple times. Thanks so much for this entertaining and well-written review. It’s a terrific addition to the blogathon! Terrific treatment given one of my favorite genres made during my favorite film era. In other words, this post is right up my alley!! In retrospect these movies seem to have been on TV consistently when I was growing up. Anyway, you manage to explain the why and how beautifully so we can put these productions in historical context. This is one we couldn’t have done without so thank you for contributing it to the project. Love me a wartime musical. How do they manage to be so glam despite the austerity measures?! For anyone less than a super fan the interludes are a bit of an ask but I adore the escapism. It’ve always found it odd that films that take such a serious subject backdrop can be so lightweight and frivolous. I know tastes (and popular genres!) have changed, but you simply can’t imagine a contemporary musical tackling a modern war in the same way. This was an excellent post. I enjoyed reading it. Very information and well written.